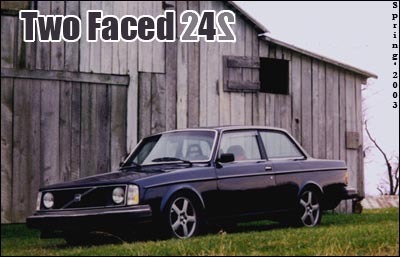 Two-Faced 242 - for show or all go? Rob Prince's weekend warrior spends most of its time getting tossed about the twisty roads and tracks up and down the east coast, but throughout its regular beatings it still manages to shine through in its good looks. Whether its a drift nationals event at Summit Point, WV or a rally cross at Mt. Snow, VT, this car has seen it all. Originally built by Rob's former boss, this "toy" started out as a heavily juiced 12 second drag car. Since then its undergone a few changes; upgraded suspension, a few interior pieces, new front end, lots of paint, and some 17" Titan wheels help make the car a bit more streetable (streetable used loosely). The car seems to suffice as a daily driver despite its open stack carbs and straight pipe exhaust (dont'cha know the lightning bugs give it some extra power!) while the turbo bertone project and recently acquired IT race car get all the attention. Needless to say this car happens to be the most reliable auto Rob possesses so there's no doubt it will continue its reign of being the "backup car" for major events and still come out on top. 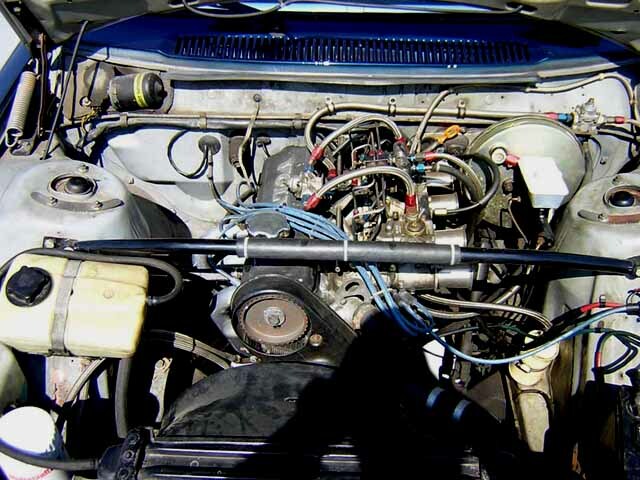 Motor: At the heart of this monster is a 1976 B21 block that was sonic-checked and bored to 2.3L then stuffed with Chevy "Pink" connecting rods and custom forged Arias pistons. Up top the headwork with custom valves and a custom grind camshaft (3500 to 7500 rpm) provide the needed flow. Matching up with the head are dual Weber DCOE 45mm carburetors and Stahl headers with Jet-Hot coating. All of this powered by an MSD 6A ignition with Moroso 8mm spark plug wires. The 2.5" exhaust uses a single Magnaflow muffler and exits before right rear wheel. Rob also added in a Top Gun 4 fogger nitrous setup for extra fun. 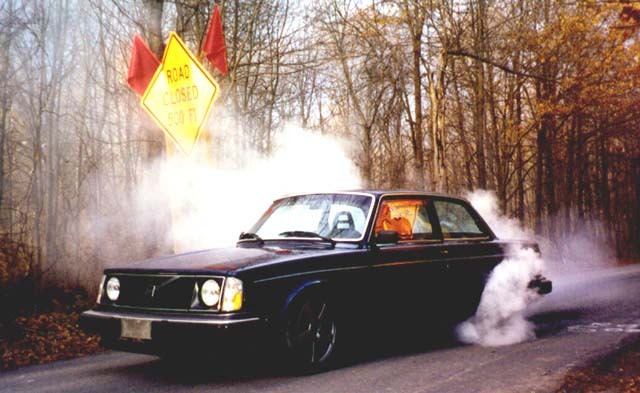 Transmission: The Volvo stock M46 with a "turbo" clutch connects the power to the wheels. Suspension: The car is sitting on custom wound front springs and cut 240 wagon rear springs and custom valved Bilstein shocks/struts provide the needed control. The IPD 1" sway bars in both front and back and custom strut tower brace stiffen up the rest. Wheels & Brakes: Volvo original Titans (17x7 with 23mm spacers) from the 850R wrapped with Falken Azenis 225/45-17 in front and 245/45-17 in the rear give this 242 some added style and traction. Cosmetic: Rob changed the front end with a flathood conversion with single round headlamps from the earlier 240's. 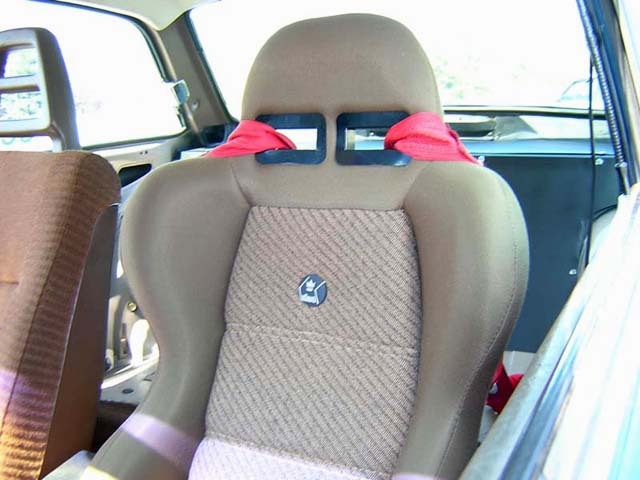 Interior: Konig Racing seats with 5 point harness keep Rob planted while drifting around town, and of course the back seat was removed.